Do you spend sleepless nights worrying about the sea level rise caused by the melting of the Antarctic ice sheet? Well enjoy your slumbers, my friend, NASA has just given you reason to sleep easier. A new study–entitled “Mass gains of the Antarctic ice sheet exceed losses” and published in the Journal of Glaciology–overturns previous assessments (including that relayed in the latest IPCC report) that Antarctica is losing land ice and thus contributing to sea level rise. As NASA states in a press release, previous assessments had falsely assumed that increasing surface height of the ice sheets was due to snow accumulation, but the new study shows that the rise in elevation is in fact due to ice gain. The upshot is that previous assessments, including the IPCC’s, got the Antarctic contribution to sea level rise–previously pegged at 0.27 millimeters per year–precisely wrong. “The good news is that Antarctica is not currently contributing to sea level rise, but is taking 0.23 millimeters per year away.” Well, they were only off by 185%, I suppose, and got the change in the wrong direction. It could be worse…I mean better. Remember when “NASA satellites detect[ed] unexpected ice loss in East Antarctica” in 2009? 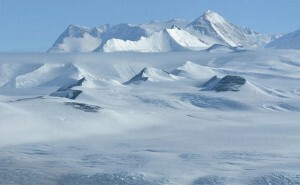 The results were “unexpected” because East Antarctica was previously considered stable, with the continent’s ice loss (well, net gain) supposedly taking place in West Antarctica. It took a science-hating-denier-skeptic-heathenbeast to point out that the numbers were derived from gravity measurements which were picking up on isostatic adjustment, i.e. changes taking place beneath the surface of the ice, not changes in the ice levels themselves. And lo and behold a few months later a team led by another NASA JPL researcher found that the gravity measurements had in fact been measuring…wait for it…isostatic adjustment. This is not an isolated phenomenon, of course. 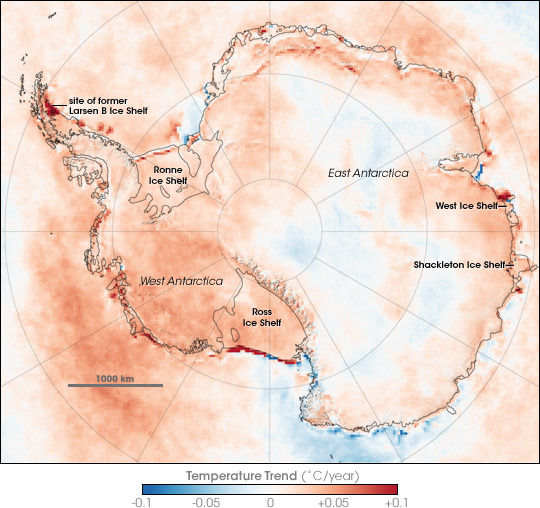 Do you remember when NASA released this dramatic image of the temperature trends in Antarctica showing a clear positive warming trend of between 0.05C and 0.1C throughout most of the continent? Did you notice the fine print at the end of the third paragraph where it’s casually admitted that the level of uncertainty in the measurements the map was based on was between 2 and 3 degrees C, or 40-60 times the increment they claimed to be measuring? This type of utterly meaningless exercise in map coloring would get you an “F” in any undergrad science course, but it’s good enough for NASA. Yes, this is the same Club of Rome that predicted the complete exhaustion of over a dozen resources in its 1972 “Limits to Growth” publication, every single one of which failed to come true. And yes, this is the same Club of Rome that then celebrated their “Limits to Growth” fearmongering failure by doubling down with a giant 40th anniversary “celebration” of…40 years of considerable growth? Stay tuned to these pages for ongoing coverage as we approach COP21. Where to start? James Lovelock of Gaia Theory fame emphasized that the collecting of empirical data with such a complex system was the only way to determine what effects humanity might be having on planetary systems. Modeling he wrote would not be accurate enough, that what is needed are scientist taking accurate measurements at many multiple points to gather the data needed for accurate assessment. While many wish to believe that humanities activities have no effect on climate this is also not proved. Perhaps in combination with natural occurring phenomena science will find the truth of why and how rapidly the planetary climate system may be changing. One must remember that initial earth life consisted of simple bacteria and such that flourished in the then largely methane atmosphere, giving off oxygen as a by product until they poisoned themselves to extinction by altering the atmosphere significantly enough to do themselves harm.The troposphere is a very thin layer of air which contains within itself all the life forms of our planet. How thin? Pilots are warned to begin using compressed air above 10,000 feet. Do we want to gamble and continue as presently or do we think that just perhaps and maybe we should be doing proper science to determine if what modelers are finding has any truth to their work? As far as political and corporate agenda existing there can be no doubt and this makes doubly certain that we need clear unequivocal untainted scientific evidence as to what is taking place. What the corporate-political nexus have as their agenda (21) may also be their scheme for mitigating climate change to their own benefit while also engendering fun and profits in a technocratic world where so few humans may be necessary to maintain future standards of living for the various economic classes. How could reasonably sound models be pursued when there is no transparency on geoengineering projects going back decades? Le réchauffement climatique a commencé à la fin du dernier petit âge glaciaire (1700). On observe un lien entre le cycle d’activité du soleil (les taches solaires) et les variations de température. L’Antarctique grandit si vite qu’il tend à rejoindre l’Amérique du Sud. excédentaire par rapport à sa moyenne connue. De 1950 à 1989 le taux de CO2 croît et la température baisse. La montée et la descente du niveau des océans suit le cycle des 60 ans. La mécanique céleste – à savoir les oscillations du Soleil autour du centre de masse du système solaire, oscillations dues aux grosses planètes – influence les températures. La quantité de CO2 est très faible mais suffit à arrêter presque tous les rayons infrarouges émis par le sol. Plus de CO2 n’y change rien. Une centrale thermique a une productivité de 80 à 95%. Le vent en Allemagne…14,8% ! Les variations du vent perturbent sans cesse la production et les centrales qui accompagnent les éoliennes sont les plus polluantes. L’Allemagne consomme même sa lignite car elle ne coûte « rien ». Les centrales les moins polluantes sont fermées… faute de rentabilité. Même si l’Europe se saigne à mort – ce qu’elle est en train de faire puisque ses industries ferment – et réalise les objectifs du GIEC, elle pourrait éviter en 2020…0,014°C, impossible à mesurer ! Donc, même si on fait ce que commande le GIEC, c’est inutile. Le grand mensonge d’Al Gore : le CO2 fait monter la température. Il n’a pas d’effet sur la température. Le réchauffement libère le CO2 des mers. Ces modèles du GIEC varient entre eux de 1.600% (!!) et comportent… 300 paramètres. Aucun n’est validé par les observations. 21. L’analyse fine des écarts de température par rapport à la concentration de CO2 ne révèle… rien ! Il n’y a pas de lien CO2 – température. Tout simplement, le CO2 joue déjà à 95% son rôle qui est minime. 24. La Terre est une planète mourante faute de CO2. Augmenter le taux de CO2 est donc une bénédiction, le seul vrai moyen de faire reculer le désert. Just cut and paste into Google Translate. Cut and paste back here. I’ll touch up the robot-speak a little. Global warming began at the end of the Little Ice Age (1700). There is a link between the activity cycle of the sun (sunspots) and temperature changes. A cycle of 60 years of cooling followed by warming is evident. It appears we are at the beginning of a cooling period. Another cooling took place between 1940 and 1970. Antarctica is growing so fast that it tends to reach South America. excess relative to its known mean. From 1950-1989 the CO2 increases and the temperature drops. The rise and fall of sea level is following the 60-year cycle. Celestial mechanics – namely the oscillations of the Sun around the center of mass of the solar system, oscillations due to large planets – influences temperatures. The amount of CO2 is very low, but enough to stop almost all infrared rays emitted by the soil. More CO2 changes nothing. A thermal power plant has a productivity of 80 to 95%. The wind in Germany … 14.8%! The wind changes constantly, disrupts production, and accompanying wind power plants are the most polluting. Germany consumes even its lignite because it does not cost “anything.” The least polluting plants are closed for lack of profitability …. Even if Europe is bleeding to death – which it is, because its industries are closing – and realizes the IPCC targets, it could avoid in 2020 … 0,014 ° C, immeasurable! So even if we control to IPCC standards, it is useless. The great lie of Al Gore: CO2 raises the temperature. It has no effect on the temperature. Warming seas release the CO2. The IPCC models vary them 1600% (!!) and have … 300 parameters. None are validated by observations. 21. The detailed analysis of temperature deviations from the CO2 concentration reveals … nothing! There is no link CO2 – temperature. Simply put, the CO2 already plays to 95% its role is minimal. 24. The Earth is a planet dying for lack of CO2. Increasing CO2 levels is a blessing, the only true way to roll back the desert. Thank you so much Hankblackgraphics for this gesture! I’ll be smiling with every spin of the hamster wheel today! It was fun and easy. I am no computer whiz. I also don’t speak French, so when I wasn’t sure of certain passages, like article 21, I did not edit the Robot-speak. A good question. Let’s add some context. Who here thinks this is the path that people claiming to be “truth seekers” should be forwarding? See also: the noble lie, a favorite idea of the Straussians (aka neocons). Assuming we do not want to promote lies in order to get people to act in the way we think they should, what is the best alternative? What intrigues me about your position on this issue James, is that in my experience of life and the political milieu that I have grown up in, Green issues (with climate change firmly at the centre of those issues) have had their most consistent advocates in anarchist thought. In my reading, your adherence to anarchist ideals is at odds with the politics of so many of those who devote time and money to questioning the science of climate change. By far the biggest pool of doubt about the effect of burning oil, coal and gas, has come from those industries themselves, closely followed by the opinion bodies of global corporations who are powered by them. The critique of the AGW case is most frequently framed as ‘this is a state power grab’ – and, I would say, an argument that rests on the supposed dichotomy of state and market, of government and big business. This is a duality that I do not believe exists. The huge technocracy that humanity has created has been powered almost exclusively be the fossil fuel revolution, and the undeniable destruction of species, of soils, forests, the sea, of whole ecosystems, of self sustaining and genuinely independent human communities, has been powered by these fuels (i.e. it simply could not have happened without them). This is something (like authoritarianism) that transcends the divide of economic opinions about state and market, capitalism and state communism, it is a fact of industrialisation and materialist culture. Many of those who have sought freedom in the simple activities of working with the Earth, with plants, animals and the elements, experience a direct repulsion of the culture that has emerged from fossil fuel power. Climate arguments aside, the machine age is smelly, noisy, often dangerous, and polluting in ways separate from CO2. Agriculture is a case in point. First hand experience of the effects of pollution. The most resilient and self reliant people I have met in my life live off the grid, relatively disconnected from the state/ corporate machine that surrounds so many populations. They have simple lives, grow their food, have very little energy needs – which they harvest from solar panels, wind and water turbines. I think it is worth considering that I cannot go and dig up a load of oil or gas; that by using those fuels I am linking to a huge system of techno-political power and control. Small scale green technologies surely fit the libertarian vision far better than fossil fuels ever could. The twenty five years of climate politics that we have just lived through have seen state/ corporate spokespeople repeatedly saying that they are “going to get serious about climate change” – but at the same time emissions have risen without any real abatement. I have always considered that the reason this has been so, is that the powers that be do not want a population who are self empowered. In short there is a direct link between motive power and political power. Green anarchists spring from a slightly different path to the libertarian traditions of N America. The latter, I think it is fair to say, place a lot of emphasis on the state abuse of power, and perhaps this explains why (I would argue) there is more sympathy for questioning climate science than in the European anarchist tradition (or what remains of it). I adhere to the notion that all pollution has an effect, and so I am not convinced that there is nothing to worry about with regard to carbon gas emissions. I am interested in the choices you make for supporting your arguments, and I think they are telling. Access to land is our source of independence from tyranny, and regardless of the effects of burning these fuels, the way that fossil fuel technology has changed our relationship to land is reason enough to move away from their use. Is the Republican strand of climate skepticism/ denial an elaborate ruse? part of the plan by the globalists to muddy the waters around the hoax? Is the massive corporate cover up and suppression of evidence a huge double bluff? The Koch brothers with their schemes, are they just not in on the whole hoax thing? Didn’t get the memo? The parallel with smoking related cancer is repeatedly made for obvious reasons. The science was corrupted by vested interests, the risks downplayed, denied. The same actors are involved, the same companies and individuals spreading misinformation. Do some more reading – challenge your own position James. The whole issue has been hijacked by central planners and elite interests, that I grant you, but rejecting the science of what is happening is like saying to a smoker who has contracted cancer, “Well you cannot *prove* that smoking made you ill”. From Santa to Satan, we embrace lies, and even feed them to our children. “We” have little control over big infrastructure issues like energy generation and the automotive culture. We use them as consumers, but really have no say in their establishment, other than to champion things like wind power, after being properly brainwashed. (The previous comment provides damning statistics for wind in the links, just as an example). ‘We’ are here to be led by propaganda, so we can love our subjugation and provide a smoother environment for those raking in profits and relishing control. When they are good and ready to make a profitable shift, the big boys will do it. Of course some sort of technological shift is eventually inevitable. We are now just being softened up with a bombardment of propaganda, and even a new religion, to be very supportive of long overdue changes when they roll them out. As Jim Marrs says, I can see the day when it will be natural to say that I am from the planet Earth, rather than from Texas, or the US, or Borneo, or whatever. So why resist the benefits of a one world government, religion, language, moral code? Well, currently we are dominated by a regime of lies, secrecy, and wars, that’s why. It is also the paradigm that still resonates with so many humans. The awakening will take generations. Machiavellian schemes are trumped in the long run by valid ideals, such as clear and open motives,transparency, and honesty. In other words, don’t try to outsmart the devil at his own game. So, all I can see right now, is to keep on promoting truth and honesty in every personal and public transaction. Don’t try to leverage or manipulate anything, or any people, based on lies. You are really starting to sound like a republican. Now you have disparaged Limits To Growth, the most accurate assessment of the Earth System ever to be written. We know this is true based on the apoplectic reception it received by the school of neoliberal economists upon its publication. It is one of the first books I read in pursuit of my education as an ecological and environmental biologist. To this day it remains the most accurate tome of its kind and economists still react apoplectically when ever it is mentioned. You now seem to me a cornucopian as well. 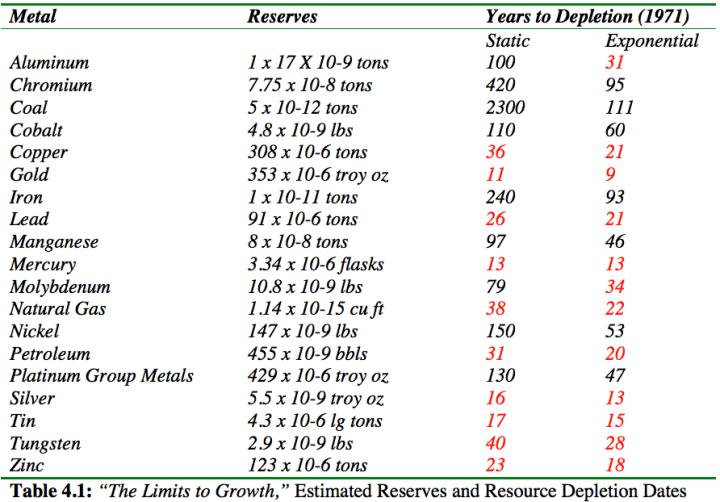 Inclusion of the table of strategic resources is meaningless. It is unfortunate that the authors decided to include predictions of resource consumption; all such predictions are useless. The people who prepared these numbers perhaps did not imagine the infinite malfeasance exerted by criminal financiers in crashing the global economy. The only resource that really matters is oil (and natural gas), the feed stock for liquid transportation fuels. EVERY aspect of the economic system that was allowed to emerge, unfettered capitalism, has been and is entirely dependent on cheap and dense fossil fuels. It is in this area that you really get in trouble because your cornucopian outlook runs face first into such arcane realities like the laws of thermodynamics, energy density and energy profit ratio, realities that are immutable, constraining and easily quantifiable. Your viewpoint betrays an ignorance of all things energy. US conventional oil extraction in the lower 48 peaked in 1970 as M. King Hubbert calculated it would in 1958. Global conventional crude oil extraction peaked in 2005. These are verifiable facts. The “oil” that replaces the high-quaility crudes on which the global economy feasted since Tittusville is being replaced by sources that are too expensive to extract, both financially and thermodynamically. Thoughtful people calculate that this economy, the globalized economy, can’t function with energy profit ratios below 10. Tittusville oil, as did all of the low hanging fruit, provided EPRs of 100. This is the most important aspect of the discussion about energy. The Monterrey Shale Play, up until s couple of days ago, was touted to contain 15 billion bbls of oil equivalent. California was making ambitious plans for the tax windfall this bonanza would provide. The USGS has restated that resource to be 20 million bbls, about one day’s worth of US oil consumption. Ooops. This result is what is to be expected with all tight oil as the lies about tight oil become too evident to ignore. You have readers who believe in abiotic oil. This belief is the nadir of dangerous stupidity. That you don’t call these people out detracts from your overall credibility. You have readers who believe that geoengineering can influence weather (as opposed to climate). This sort of thinking is just madness. Climate is driven by the sun and nothing else. So perhaps it would be useful to contemplate these figures. The energy content of all fossil fuels, both consumed and still in ground has been estimated by some geeky scientists, when quantified in watts, to be in the order of magnitude of 10 to the 27th power. The amount of sunlight incident onto our planet EVERY DAY, when quantified as watts, is 10 to the 27th power. To follow the logic of the geoengineeringophiles the “manipulators” somehow conger amounts of energy that are equal to significant percentages of all the fossil fuels that ever existed to alter weather patterns. Why wouldn’t these masterminds instead use these vast amounts of energy to power our economy? Oh, I forgot, it’s the NWO’s objective to enslave us all and one of the ways to do that is to geoengineer our weather. Yeah, right. kind of liberal construct to support nefarious reports that human beings are causing our climate to change. In fact, it is the greenhouse effect that makes earth habitable. Our atmosphere, 77% percent nitrogen, 23% oxygen, is a blanket that is permeable to UV radiation. When UV light strikes our planet this energy transforms to wavelengths in the infrared spectrum. Now I understand that there are people skeptical of this process because it’s been proved by scientists doing science but, honest, that’s what really happens. By the naturally occurring processes of conduction and radiation, this infrared energy, heat, wants to re-radiate back to space because hot flows to cold. During the billions of years that the Earth System evolved our atmosphere retained some of thi heat because it is opaque to IR wave lengths. This happens in a state of dynamic equilibrium, a balance that results is a benign environment – Gaia. Photosynthesis sequestered excess carbon in the atmosphere into what became fossil fuels. The planet cooled down over who knows how many millions of years and ultimately reached a level at which all flora and fauna could flourish. This benevolent environment remained fundamentally constant though there were certainly perturbations caused by volcanoes and asteroid impacts but the state of dynamic equilibrium persisted. Until the beginning of the fossil fuel age when all hell broke loose. Nearly nobody understands the speed at which humans beings have released this carbon. We’ve dumped billions of tons of sequestered carbon back into the atmosphere in merely a blink of the geologic eye. Our atmosphere is becoming more opaque which means more heat is being trapped and that results in a warming planet. This is how it works. If a climate denier were to take a class in environmental science at the 300 level, let’s say, (why a climate change denier would enroll in such a class is another question) and was asked to explain the greenhouse effect, if he/she said he/she didn’t believe such hogwash the instructor would fail he/she and rightfully so. This would be the grade for all deniers. Correct me if I’m wrong but I believe you also pooh-pooh that population is our biggest problem of all, that talk of carrying capacity is utter nonsense. Compare the graph of world oil consumption since Tittusville with the graph displaying the current world’s population. The 2 curves are identical. Exponential growth in the world’s population was only possible by converting vast quantities of oil and natural gas into food. The only conclusion that can be drawn with regard to population and oil is that when the oil depletes so to must the world’s population deplete. The only question, really, is how viscous depopulation will be. Still waiting to see that you’ve invited any of the people I listed in a previous post – I replied to the poster called Corbett though I hardly imagine I could provoke a direct response from you. As stated previously your 9/11 work and Fed reporting are good but your positions on energy and climate, for me, are very unfortunate. I agree that the science is fundamentally flawed. To the extent your analysis is designed to confirm or disprove a specific hypothesis. The IPCC is essentially doing research in this manner which, along with other factors, completely undermines any sort of unbiased fact driven research. You’re right to point out poor analysis given by respected authorities continues to have to be retracted when contradictory information presents itself. My general sense is that our scientific approach to climate science frequently lacks the humility which would force us to consider (and respect) the limitations of our abilities to make accurate far reaching statements about what we can prove is leading to what. Finite statements about long term sea level changes for example just don’t take into account constant change which has been happening since way before the idea that we were contributing to this or that factor would’ve been conceivable. That doesn’t however mean that it’s not happening, but recognizing it as such at least potentially circumvents phony inconvenient truths. I don’t however, think that because people are throwing out predictions about long term environmental trends, there isn’t proof that there are changes happening like the rise in the surface temperature in the oceans. I’m highly skeptical that an argument that human activity is responsible for this change. Again, it’s an assessment that there’s still plenty of changes that are taking place which are beyond the scope of what we ought to grant ourselves with permission to analyze with precision. There is phenomenon such as destruction of areas of coral reef for example where it seems pretty evident that things we are doing are causing massive devastation to various habitats. In line with my comment about the “Cowspiracy” documentary, I think there are far bigger elephants (or piles of cow manure) that we can point to and analyze and recognize the role of humans in that degradation, that ought not even be scientifically controversial unless your a spokesperson for the industry in question. I think focusing on these sorts of arguments is a practical way to find a certain amount of common cause with some of the real environmentalist who care, but are being mislead, and demonstrate that there are issues like nuclear waste and oil spills which are “energy” policies which ought to be at the forefront of activism. I’m more concerned with BP and others causing obvious environmental destruction through spills and what not than trying to find strategies to “limit emissions”. I think shifting the conversation towards these immediate concerns would be a more practical tactic than focusing too much on what the IPCC really represents. We don’t even need to win an argument on these other things, most rational people will recognize that concerns such as those mentioned above ought to take precedence over the climate summit hamster wheel sessions. I’d even say there are business opportunities in creating solutions which don’t require (and shouldn’t) federal stimulus and initiatives. I see this as just one aspect of what could be a more proactive approach to undermining some of the false solutions being concocted to perpetuate these nefarious market based charades being proposed by world “leaders”. François Gervais makes a point of saying that of course we must find alternatives to fossil fuels – that we must give science some time to do so and that until we do find them the human cost of abandoning fossil fuels is too great, especially based on entirely fabricated climate alarmism. Furthermore he says that putting CO2 (that of the industrially created type must be filtered to remove toxic pollutants) helps plants to grow throughout the world attenuating dire situations for people in extreme climates. Most people want cleaner air but do you want mendacious murders, prestigious peadophiles and ignorant celebrities leading humanity’s projects or people who believe in “Man’s” capacity to be responsible, cooperative and forward-thinking who are still connected to some form of morality and respect for life? So the question is, WHO do you want to be leading the world away from fossil fuels? Normal people who see it in their best interest and that of future generations to do so. My parents put solar panels on their home and not only run entirely on this source for energy, they’re even able to “sell” back surplus energy (I’m not sure how that works). My Mom has worked on a volunteer basis for the town’s energy policy, reducing waste, and she’s done the groundwork to put solar panels on the roof of the town’s trash facility to provide similar benefits to the town financially and people in general on an ecological basis. Yes, there are tax credits involved in this process. This seems to be one of the few examples where government has recognized, not just from an ecological standpoint, but from a cost efficiency standpoint that there’s benefit in encouraging implementation of these sorts of policies. Entrepreneurs can lead the way in pushing new technologies and creating alternatives instead of sitting around waiting for some conglomerate to misuse tax credits in typical corporate fashion to create inferior products and technologies. This is already happening but it should be encouraged. As I pointed out, there are already alternatives and the idea that we need to give time to consider the “human cost of abandoning fossil fuels” being to great is the type of statement I find highly suspect and undermines my confidence in his motives for arguing against “climate alarmism” even if the basis he’s doing so is on sound scientific research. I have the same beef with this logic as I do with the lack of objectivity when it comes to the IPCC and I don’t understand why people who correctly point this out don’t see how the work of so called climate “deniers” (a term which I reject) are supporting those with vested interests in the fossil fuel industries, whether or not it’s intentional. When I say “I don’t understand why people…” it’s not intended to be an insult, I just honestly don’t. Even if the C02 argument is a fabrication there are practical reasons to move away from fossil fuels, be it disasters like the BP spill (one of many), other general forms of pollution and contamination of water resources through fracking, and one of the biggest chess pieces of all the oil politics which dictate so many of the policies all of us here find outrageous. Of course I don’t “want mendacious murders, prestigious peadophiles and ignorant celebrities leading humanity’s projects”, I want people like my Mom for instance to take the initiative on real alternatives and stop allowing the perpetuation of meaningless climate summits and promotions of an “alternative” paradigm guided by the same interests who’ve engineered Middle East oil politics. First of all, are you familiar with a certain Maurice Strong? Or John D Rockefeller of current Rockefeller prominence and power? Well if you are then you know that many of the same forces historically and currently leading the oil industry are the very same ones leading Agenda 21, Agenda 2030, the so-called ‘environmental movement’ and the trillions-dollar juicy eugenistic fossil fuels regulation business killing brown people and enriching diversified elite oil moguls among others. Anthropogenic climate change deniers are denoucing manipulation by the people who’ve taken power through petrol and who’ve also enriched themselves through the dishonestly manipulative AGW scam. No paradox there. Secondly, my heartfelt congratulations for your mother’s laudable initiatives. Laudable initiatives have always had my unmitigated support as well as that of this website’s owner I believe and the majority of its posters. However, these initiatives are in no way contradictory to denouncing a lucrative pseudo-environmental social engineering scam (possibliy aimed at murderously limiting brown-skinned people’s access to the bare necessities of modern life and ushering the world’s populations into so-called “sustainable”, ubiquitously monitored smart cities) engineered by some of the same folks who brought us the fossil fuels industry. suggests that denouncing man-made global warming alarmism means supporting the use of fossil fuels which is a straw man fallacy and patently false. Of course there are practical reasons for moving away from fossil fuels and neither me, nor François Gervais, nor James Corbett nor many other so-called man-made climate change skeptics ever suggested the contrary. is curious. Indeed given the possibility that François Gervais may well have entertained the ideas outlined above, and in the absence of any evidence suggesting that he has any other reasons than personal conviction for denouncing the Climate Change lobby, there is no reason to doubt his motives for not encouraging developing countries to pay for the pollution sins committed essentially by “the wealthy Occident” nor for them to bear the monetary and indeed human (in terms of lives lost) cost of developing the efficiency of renewable energies that are presently still very expensive and relatively inefficient when they and their children are dying of having no access to a minimum of electricity. Consequently your position remains confusing and contradictory to me. So I reiterate my question: Do you want to see Maurice Strong, the Rockefeller family, Al Gore and the undeniably murderous United Nations managing the world’s move away from fossil fuels? Just wanted to thank you for your reply and let you know I’ve responded but as my response was rather long and includes a couple of links it’s awaiting moderation and should be up in a half-day or so. So see ya ’round the campus as my Dad always used to say! Likewise, I appreciate your thoughts and the spirit of the debate. Of course not. I mentioned my Mom’s efforts because I see this as an example of being proactive and taking matters into our own hands instead of sitting around waiting for the kinds of “solutions” the parties you mentioned have in mind. I’m opposed to the idea of using phony or misleading information the way groups like Greenpeace have done even if it were used to champion initiatives which I would support, simply on principle. I’m just listing Greenpeace as an example, not because they’re champions of any initiatives that I support. Maybe they had some legitimacy at some point (I don’t know), but I see them as just one more example of hogs feeding at the climate catastrophe trough next to Al Gore, Bill Gates, and the Rockefellers. My main point (or one of them) is that we could be far more effective in our efforts to steer the discourse away from the false solutions people are being conditioned into not only accepting, but demanding, by exposing the fallacy on one hand, but on the other advocating for proactive steps that we can take into our own hands. I support the idea of exposing the way climate alarmism is being used to push an agenda, but I think we could get a lot more mileage by making a concerted effort to follow up (or couple) articles like this with advocacy for real solutions. I know I haven’t done a spectacular job articulating what it is I’d like to get at, but hopefully this does a more effective job in clarifying my position in response to your question. pmoddel mentioned the Thuderbolts Project Earlier. I have to say, when I discovered this project a while ago and began learning their research it was truly profound for me. I realised how ridiculous Black Hole and Big Bang theory really is. Black holes are Eternal but exist in a finite Big Bang Universe… huh? All because Mathmagicians reach a singularity (zero) in their equations… Anyway I digress. Does this mean I have a block of ice in my G&T again now? Oh yea! Popular Mechanics! The geniuses who claimed to have “debunked” 9/11 conspiracy theory! Strange they’re now writing about injecting particles into the air… or maybe not. Antarctic sea ice may be growing, but arctic sea ice, and many glaciated peaks in the northern hemisphere are at record lows. There is such much data on this issue that is in direct contradiction with other data that it’s impossible to make an ‘argument by effect’ rationale for a “solution” to climate change. Can’t speak for the record low glaciated peaks as I haven’t done any research of those however it’s not so well known that “Arctic seabed afire with lava-spewing volcanoes” http://www.canada.com/topics/news/world/story.html?id=81bb2fd3-63f1-476f-b0be-f48c0dc90304. Surely logic (which is in short supply at the IPCC) would suggest heat under ice = less ice? The list of supporters of our Climate Realist Collective has further expanded this week. It now has 317 names. They’re just starting up, it’s François Gervais, their info and existance seems important and as I’d done years past everywhere I went with your site I wanted to help make them known. Especially just before the COP21. I agree that Tim Wirth etc are despicable parasites (on valid concerns about pollution and weather changes) and this discussion goes a long way to shut up their damned pieholes. Let’s not get snippy with the innocent public whose reasonable concerns are being ridden on by Mr. Global for profit and power. Regarding NASA, aren’t they a PR front for something they try desperately to keep hidden? Whatever NASA says has some stink to it. Is AGW a front to hide weather warfare?